Sensai, an augmented productivity platform for manufacturing operations, today announced the launch of its pilot program in the United States. Sensai increases throughput and decreases downtime with an innovative AI technology that enables manufacturing operations teams to effectively monitor machinery, accurately diagnose problems before they happen and quickly implement solutions. 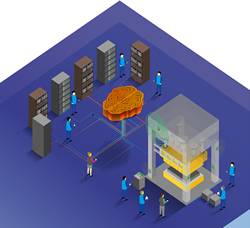 Currently, manufacturing operations solutions are siloed and offer limited collaboration capabilities, leaving plant, maintenance and operations managers in the dark about the true status of production. Through the empowerment of people and digital transformation of current assets into a modern cloud-based collaboration hub, Sensai elevates and presents valuable information from every asset and person in the production process in a simple and efficient manner. Manufacturing operations benefit from increased profitability through identification and reduction of downtime, making processes run even faster and more efficient. Sensai’s augmented productivity platform is a holistic enterprise system that combines human- and tech-based solutions, connecting, informing and using data-driven intelligence to cut costs by minimizing downtime and limiting defects. By simply installing a set of non-invasive wireless sensors that interconnect through a smart mesh network of gateways, Sensai collects data through its IIoT Hub, gateways and sensors, and instantly sends it to the cloud or an on-premise location to be processed and secured. As a result, operations teams are always aware of production status, machinery requirements and needs with fast and easy communication through user-friendly dashboards, mobile applications and cloud-based connectivity to machinery. Assessment: Cultural fit, technological capability, knowledge availability and expected business outcomes are evaluated. Sensai gets a 360-degree view of the gaps to fill and advises how to add value in a short period of time. Instrumentation: Prioritizing on the expected outcomes, Sensai maps out how to successfully monitor the shop floor based on wireless and non-invasive technology. Implementation: The operations team and all stakeholders are informed, prepared and trained to maximize the benefits from the platform. Evaluation: After the three-month period, results of the pilot program are presented and compared to the initial business case prepared in the assessment to showcase the fulfillment of the expected outcomes. Rollout: After the successful deployment of the pilot, the Sensai team looks into the next five to 10 assets that are of priority and repeats the process. “Sensai is not a cumbersome and bulky solution that will drain budgets, take years to implement, and even more years to see ROI. It is quick to implement and only grows more intelligent and valuable as it learns a business’ processes and systems. I cannot be more excited about Sensai’s ability to augment human potential through technology,” said Lima. If you are interested in participating in the pilot program or for more general information, please visit www.sensai.net or email hello@sensai.net.